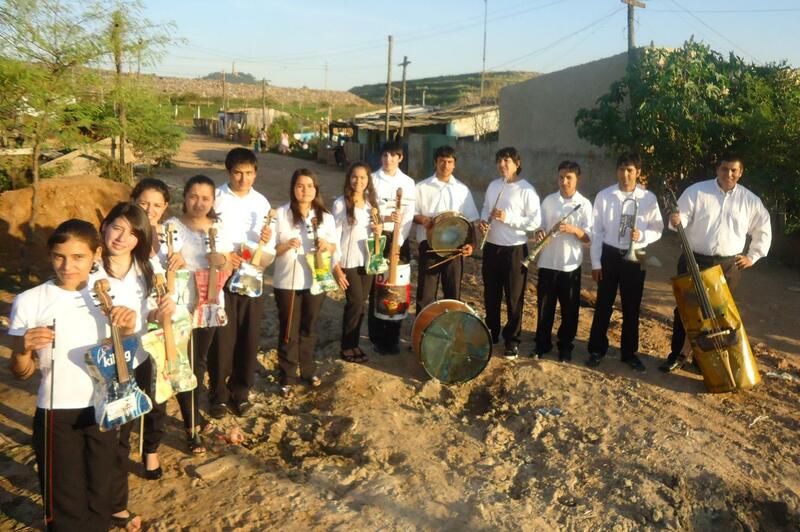 The Recycled Instruments Orchestra of Cateura, directed by Favio Chavez, is comprised of boys, girls, teenagers and young adults with limited access to resources, who live in the Bañado Sur community, located next to the Cateura landfill, in Asuncion, Paraguay. The distinctive characteristic of the group is the interpretation of musical pieces using instruments elaborated with garbage reclaimed from the landfill. The Orchestra instruments resemble violins, violas, cellos, double bass, guitars, flutes, saxophones, trumpets and percussion instruments. Among their repertoire they play classical music, folk music, Paraguayan and Latin American music, works by the Beatles and Frank Sinatra, film sound scores and symphonic heavy metal among others. The objective of the Orchestra is to design an educational process intended for children and young people who live in precarious and vulnerable conditions using music as a motivational tool and to promote the talent of the kids to allow them to have new experiences that will help them learn, stay in school, develop their creativity and have access to opportunities to have a better future.